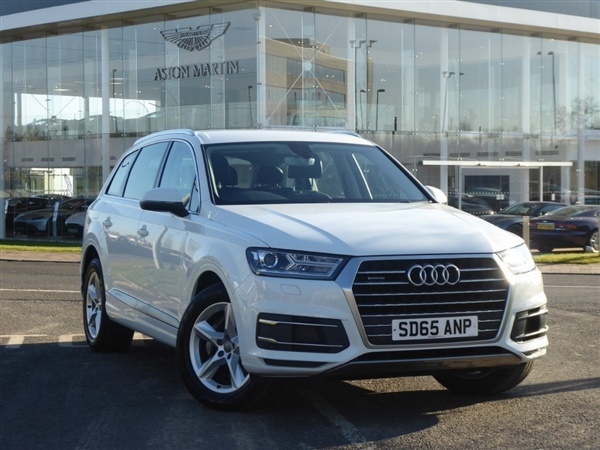 White, Heated Seats Front and Rear, Navigation, Bluetooth, DAB Radio, Cruise Control, Dual Climate Control, Parking Sensors Front and Rear, Powerfold Mirrors, Electric Tailgate, USB PortalWE WELCOME PART EXCHANGES. PLEASE CALL OR VISIT OUR WEB SITE *** FOR FURTHER INFORMATION, Upgrades - Heated Seats Front and Rear, Navigation, Bluetooth, Cruise Control, Dual Climate Control, Parking Sensors Front and Rear, Powerfold Mirrors, Electric Tailgate, USB Portal, Keyless Start, 19inch Alloys, Service history, Excellent bodywork, Black Full leather interior - Excellent Condition, Tyre condition Excellent, Standard Features - MMI Navigation Plus (HDD) with MMI Touch, Audi Parking System Plus - Front and Rear Acoustically Sensors, Automatic Start - Stop System with Energy Recovery, Cruise Control with Speed Limiter, DAB Radio, Dual-Zone Electronic Climate Control, Heated Front Seats, Voice Control System, 19inx8.5J 5-Spoke Star Design Alloy Wheels with 255/55 R19 Tyres, Anti - Theft Alarm, Bluetooth Interface, Colour Drivers Information System (DIS) with 7in High Resolution TFT Screen, Electrically Adjustable Front Seats, Hill Descent Control with Hill Hold Assist, Keyless Go, MMI Radio Plus with Audi Music Interface, Single DVD Drive for Music and Video DVDs, Supports MP3, WMA, AAC and MPEG-4, AUX-IN, 2x SDXC Card Readers, Rain Sensor, Tyre Pressure Loss Indicator, Upholstery - Twin Leather. 7 seats, All our vehicles come HPI checked & clear. We offer competitive finance quotes, get in touch today!